A couple of things are coming together in my mind this morning. In the past several days I’ve had an opportunity to visit with three of our (CEM’s) World Church co-mission pastor alumni. There was nothing formal about this; they’re just folks engaged and busy at things we needed to chat about. We weren’t doing any kind of formal evaluation of that program. Of course we referred to the experience because that experience is so central to their ongoing life and ministry. One is still the working pastor of her congregation with a busy schedule of praise, invitational and outreach events coming up soon. A second has recently transitioned form pastor to mentor and coach of the new congregational leader. Our discussion centred on a recent workshop he’d led and plans for future teaching assignments. And the third spoke of handing off to a new team over the next few months and assuming the role of “pastor emeritus.” This was kind of a joke as we both knew that there would be no rocking chair on this minister’s porch as she is busy as a Mission Advocate and supporter of several congregations in her area. Ah yes, the “rubber band”! Bet you thought I’d forgotten it. On my desk this morning was a great little ministry magazine—Congregations. One of the articles in this issue is about training leaders. (Are you surprised I turned to it first?) The author speaks of workshops and training events that are essentially rubber band exercises. 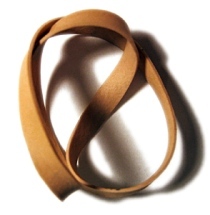 Participants come and take part, listen to the speakers, enjoy the experience and then return to their daily life and job and quickly snap back to “life as usual.” They’re essentially rubber bands that may be stretched for a bit, but will later just return to their former shape. Good magazine that it is, there is advice to avoid this sort of training. Time and money and resources being finite ingredients, what must we do not to invest in such wasteful activity? As I’m considering our strategies for developing pastors, leaders and others I’m feeling positive that we’ve learned these important lessons. Next month our CPI group will assemble for their final formation week together. They’ve learned a lot! But they’ve also created a network of support, an expectation that they are new people. Oh they will DO plenty (as have the alum I spoke of up top) but they ARE great people whose lives are already enriching what they do every day.